We recall that the U.S. government this year opened an investigation to find out if Apple had come to an agreement with the major publishing houses in the country with the aim of fixing the prices of e-books, published in the iBooks platform. Three publishers, Hachette Book Group, Simon & Schuster and HarperCollons decided to reach an agreement with the government and compensate customers of iBooks and the Amazon. For this reason, it was announced that the three companies will create a pool of $ 69 million to compensate users affected by trading on the pricing of books. For its part, Apple and publishers Macmillan and Pearson's Penguin and decided to go ahead with the trial that will be submitted to the U.S. government. 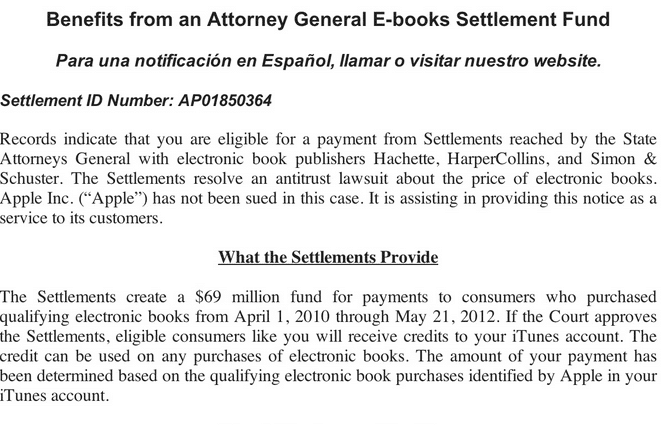 Users located in the United States who have purchased digital books in iBooks or Amazon between April 1, 2010 and May 21, 2012, will opt to receive credit in their accounts as compensation from publishers. This item can only be exchanged for new materials Apple stores and Amazon. This is a win for customers, but will have to wait until the trial ends in February next year to unblock the fund of 69 million dollars. Article iBooks customers opt to compensation from publishers has been originally published in News iPhone .